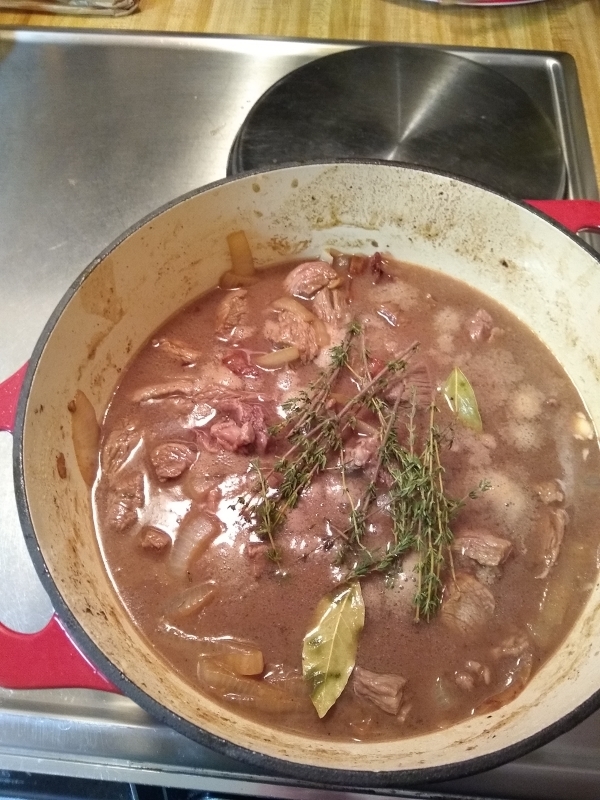 Carbonade flamande is a classic Belgian stew. 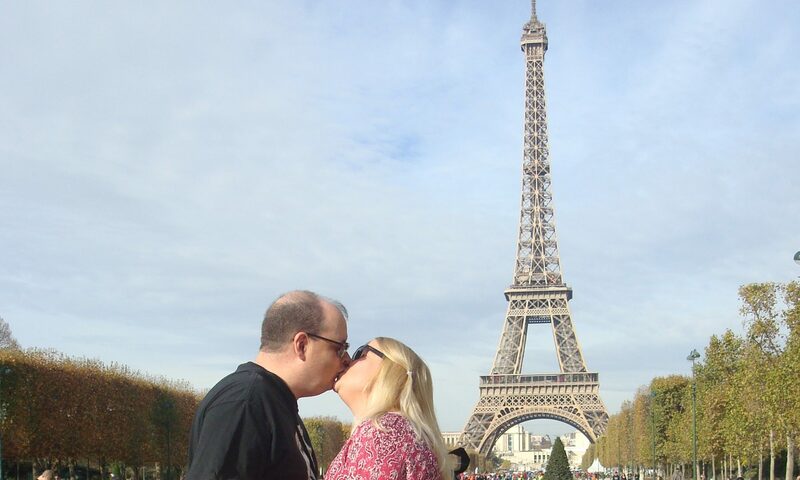 I must admit that, even though I’ve been to Belgium, I didn’t have carbonade flamande while there – I was too busy eating all the mussels in Brussels! But I saw the dish in an episode of Bizarre Foods: Delicious Destinations and just had to try it! 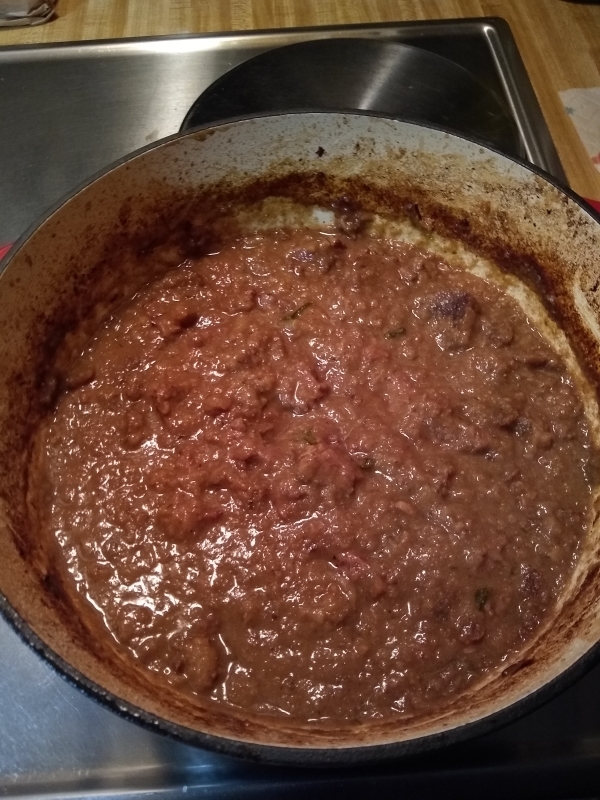 I did a test run a couple months ago, and have tweaked the recipe slightly. Try it out some time – you just might like it! 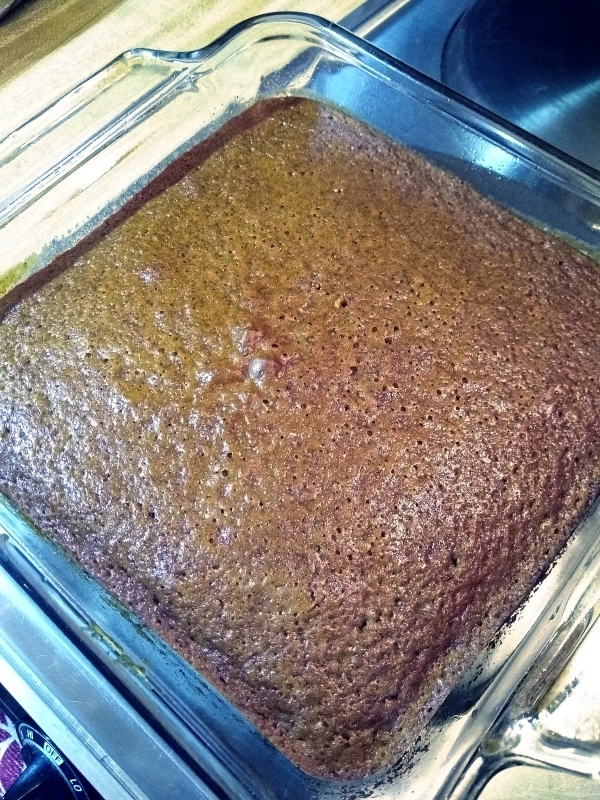 Let the gingerbread cool completely, then cover with aluminum foil. 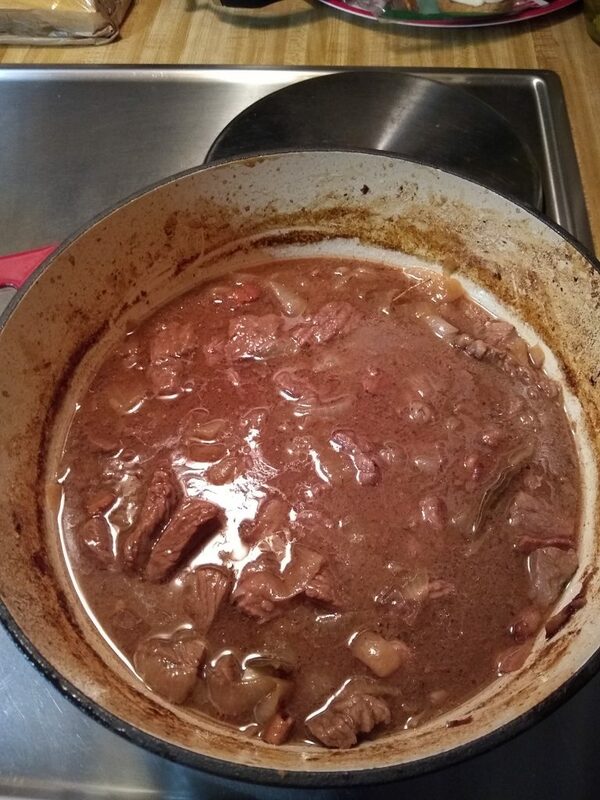 You can be super lazy and buy 3 pounds of stew meat, but for best results use 3 pounds of chuck roast instead. 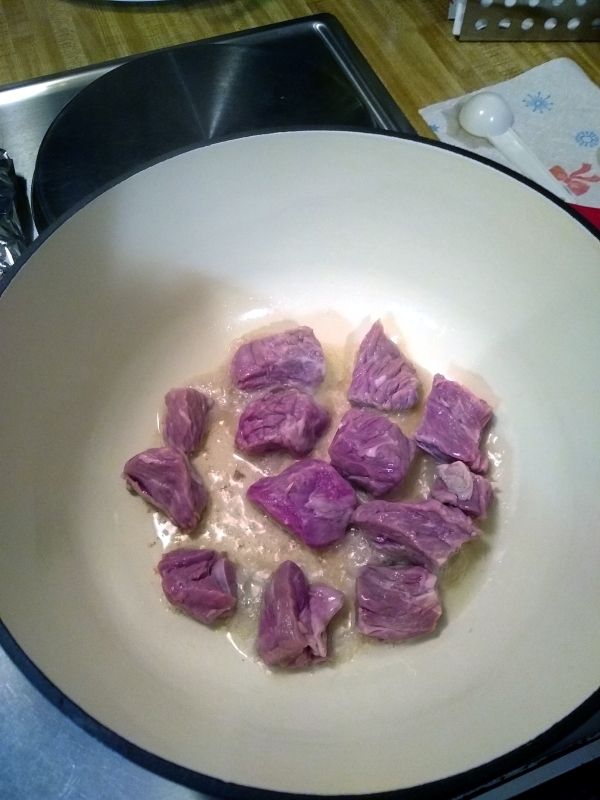 Cut a block off the roast, cut the block into cubes, then cut those cubes into bite-size cubes, trimming any excess fat as you go. See the red plastic container in the above picture? 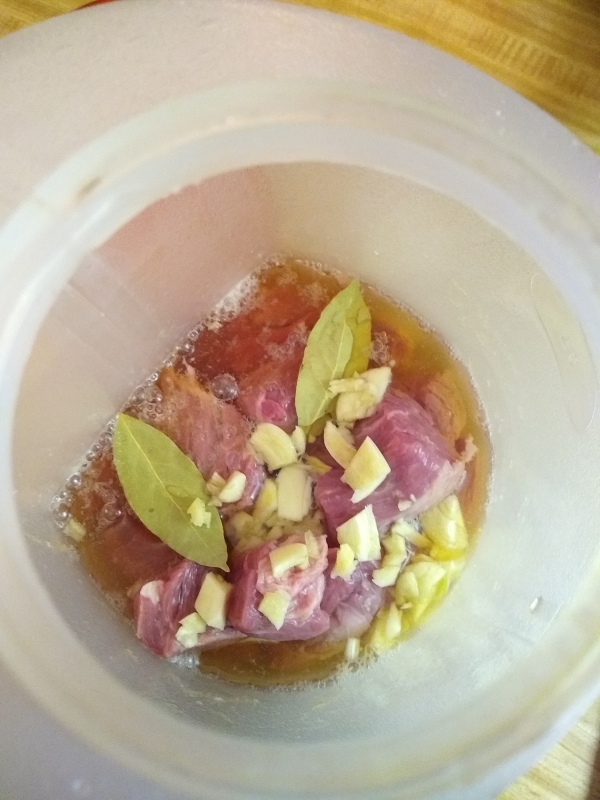 Yeah, that wasn’t big enough for the meat and marinade, so I put the beef cubes in a gallon-size pitcher, along with 3 crushed cloves of garlic, two bay leaves and two 11.2 oz. bottles of Belgian ale. I used Gauloise, a blonde ale available at my local Lidl. It’s not the best Belgian beer you’ve ever tasted, but at $6.49 for a four-pack you can’t go wrong. 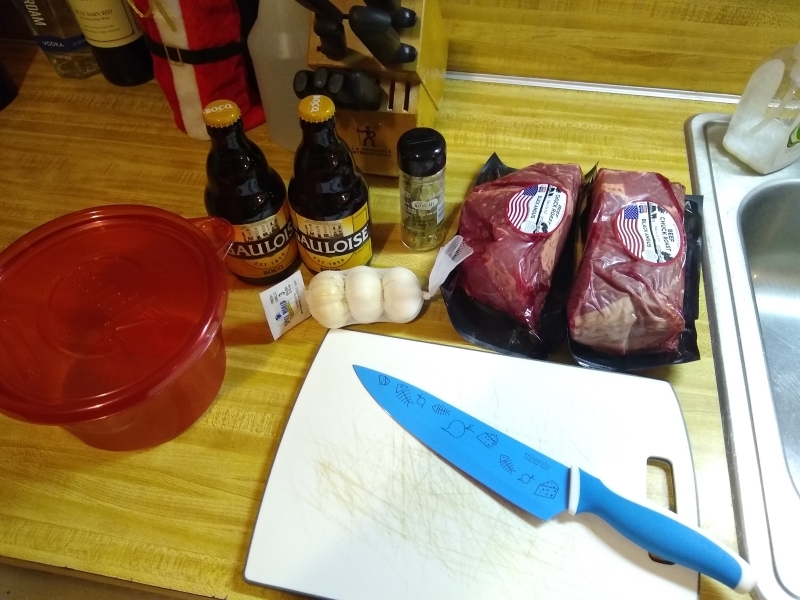 Of course, if you have a preferred brand, you can use that… especially a sour Belgian ale, which is the traditional beer for this dish. Put the meat + marinade in your fridge until the next day. 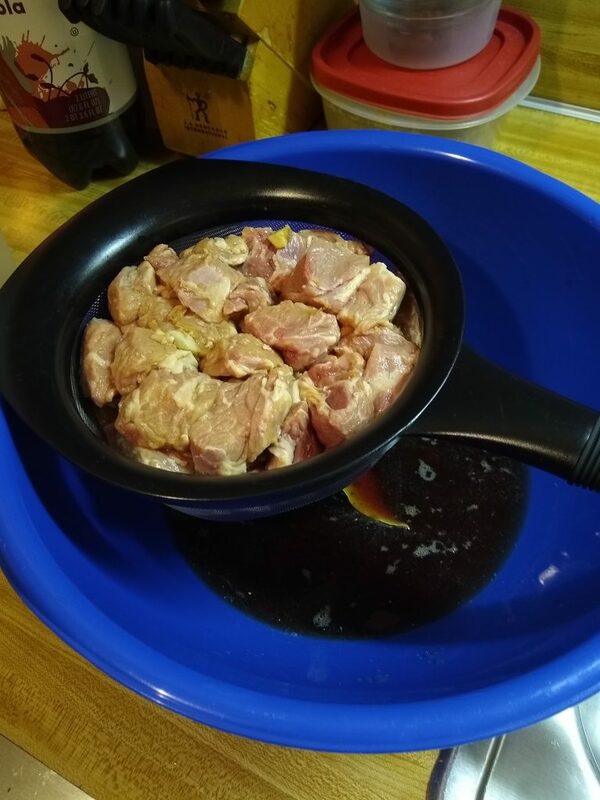 The pitcher actually worked out really well – it was roomy, and the waterproof seal made it easy to turn the pitcher over and mix everything up, which is something you should do a couple times while marinating. Why small batches? We want to fry the beef, so that it’s golden brown and delicious. 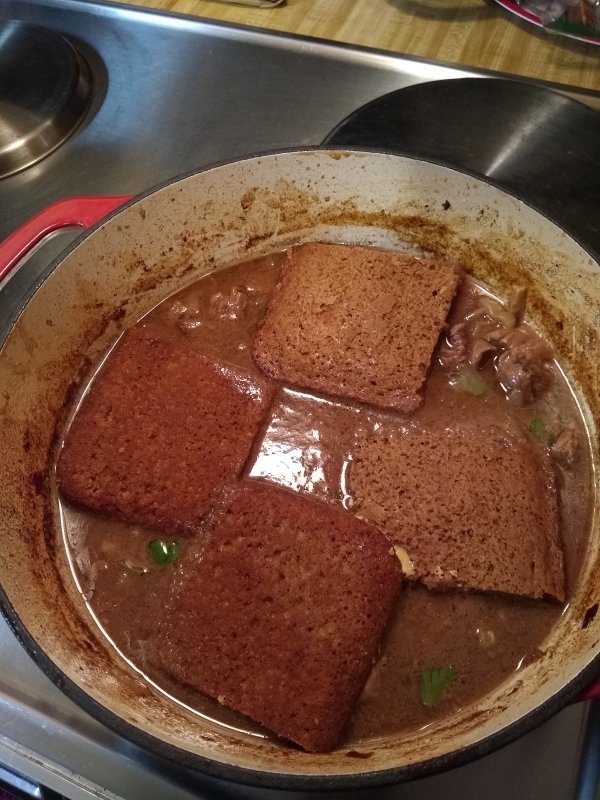 If we threw all the beef into the pan at once, it would steam instead of fry, and we don’t want that. So take your time and do it right! While the beef is cooking, stack 4 slices of bacon on top of each other, then cut into pieces. 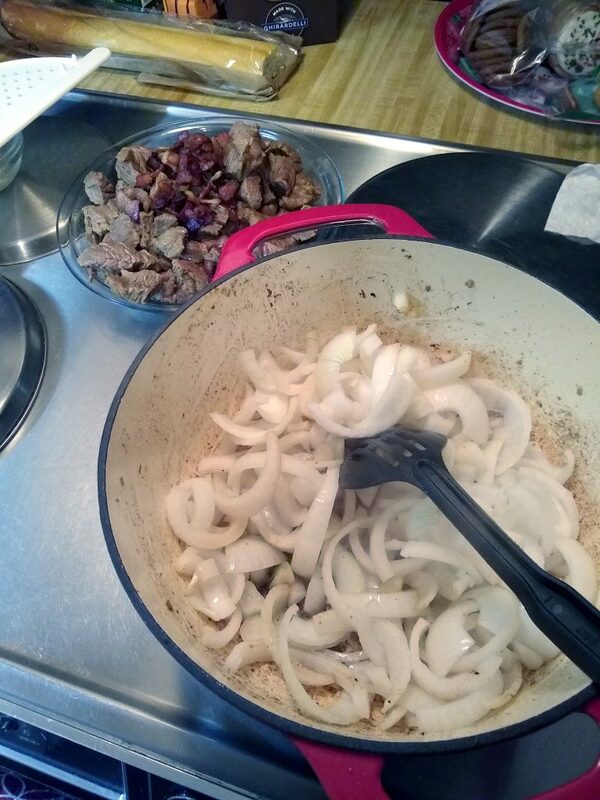 Also, slice three medium to large onions. I totally spaced on taking pictures here, but once the beef is done, set it aside and drain any water in the pan. Add the bacon and cook until crispy, then remove. Leaving the bacon grease in the pan, cook the onions for about 10 minutes, until decently caramelized. So… remember the gingerbread? 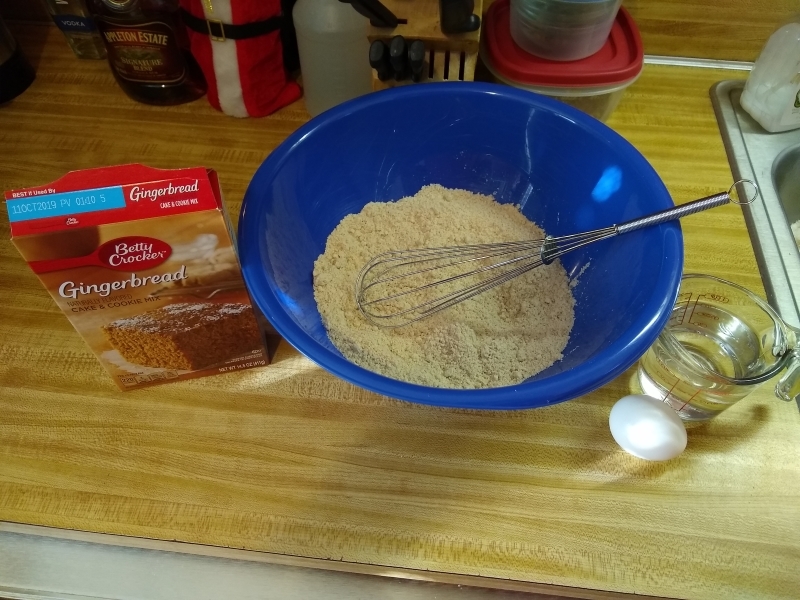 If you used an 8×8″ pan, cut the gingerbread in half, then cut it in half again, then turn each piece on its side and cut those in half. What we’re aiming for is four pieces of gingerbread, each about the size of a slice of bread. Put a total of two or three heaping tablespoons of real French Dijon mustard (don’t cheap out now!) on some of the slices… or divide it between all the slices, it doesn’t really matter. 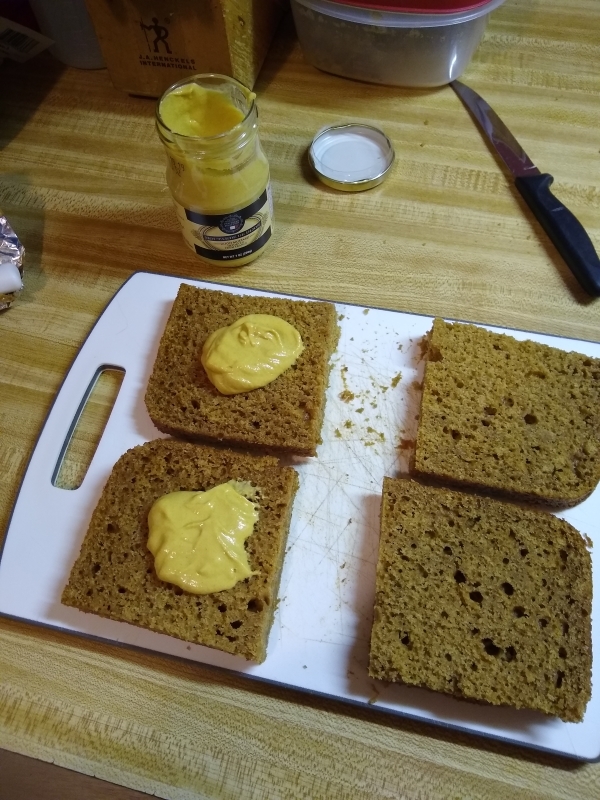 Just spread the mustard on the bread, as if you were making a sandwich. But trust me, it’s damn tasty! 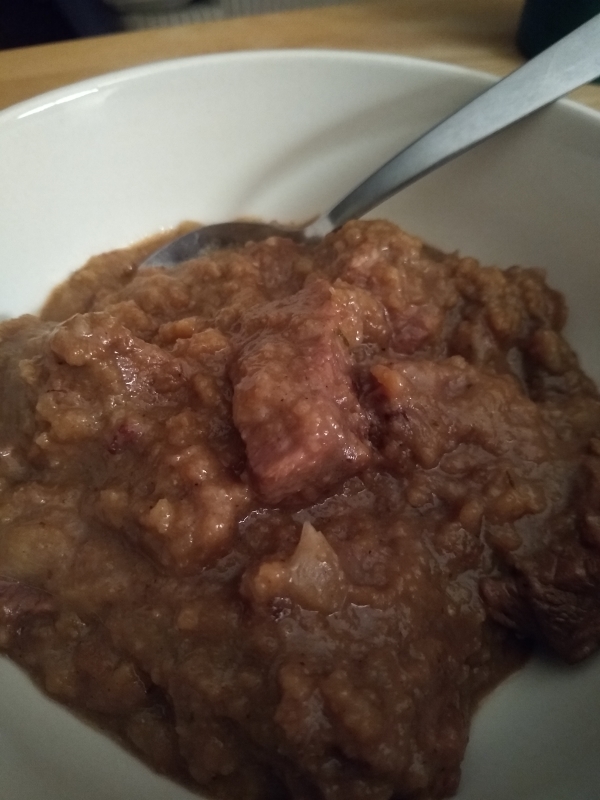 The beef was outrageously tender without being “mushy”, and there’s just something about the interplay between the ale and the gingerbread that’s just soooooo goood! You might find the sweetness from the gingerbread a bit too much – if so, some salt & pepper should fix that right up. 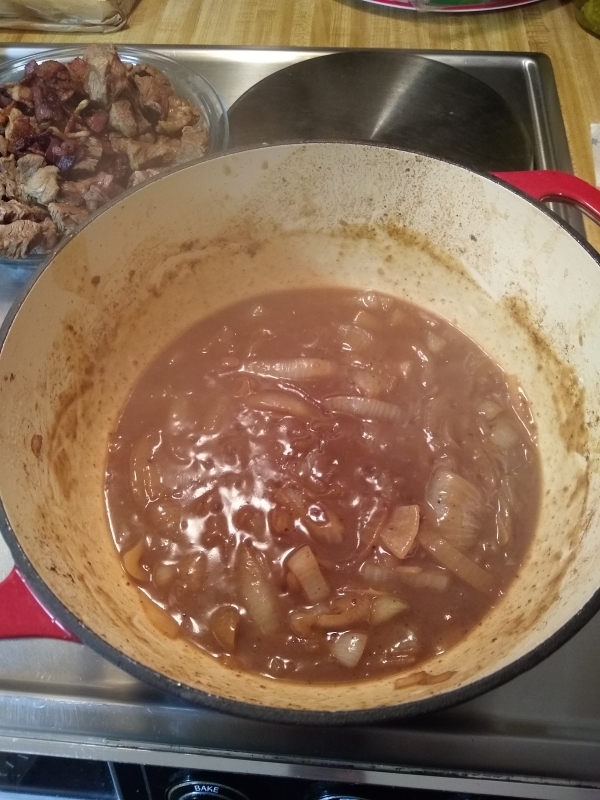 Carbonade flamande is traditionally served in a bowl with Belgian-style fries or roasted potatoes on the side. But there’s nothing stopping you from serving this over rice or egg noodles if you want.